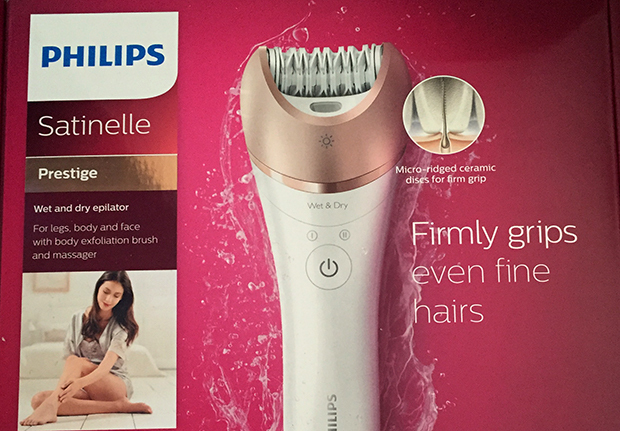 The Philips Satinelle Prestige Wet & Dry Epilator for legs, body and face. I’ve been trying out the Philips Satinelle Prestige for a couple of weeks now. It’s taken a little longer than I expected because of all the things it can do, so I needed to take the time to try out all the features. 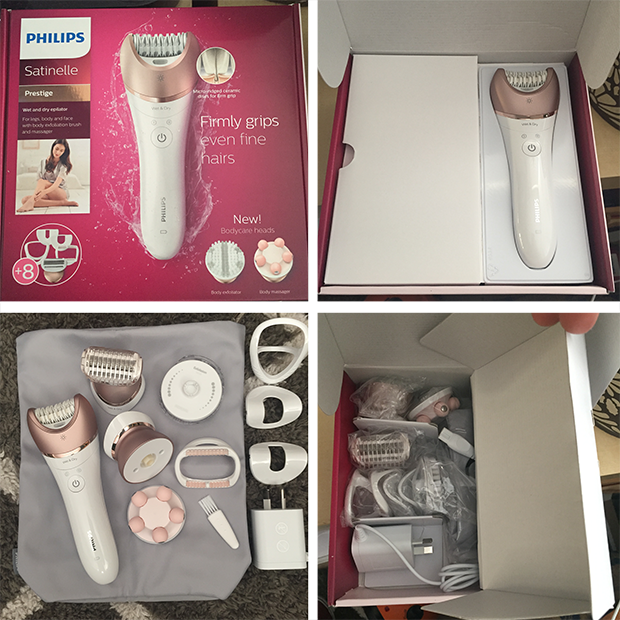 My shaving routine is pretty simple, I usually shave in the shower with a disposable (lady style) shaver so I was interested to try out the Philips Satinelle Prestige Epilitor to find out a few things like how painful? and does it work? There are three main interchangeable heads: a shaving head; epilator head; and another head that holds the body massager and body exfoliation attachments. There are other goodies, like the skin stretcher, delicate area cap and my favourite the massage cap, which goes over the epilator to reduce any pain you may have whilst using the epilator. All these extras make the Satinelle Prestige a convenient and customisable beauty tool. I love, love, love the light! There’s quite a lot to love about the Satinelle but the light is awesome. I love that you can see exactly what’s going on when you are using the epilator and it’s easy to see which areas you’ve done and if you’ve missed a bit! The massage cap really makes a difference, epilation can be painful (we are pulling out hairs people!) but the added rollers of the massage cap seem to reduce the sensation of the epilation. Wet & Dry – You can use it in the shower! The Philips Satinelle is cordless and rechargeable and has an easy to hold S-shaped handle design. It can be used wet or dry, so can be used in the bath or shower if preferred. The epilation head is made of ceramic material which gives it a better grip and the Satinelle has the widest epilation head (30mm) which gets more hair in each stroke – quicker and easier! I found the Philips Satinelle super convenient and very easy to use. It comes with an great little pouch that holds all the attachments and interchangeable heads plus a cleaning comb and charger. The Satinelle was a little shocking at first given I’m a ‘shaver’ however I have become used to the epilator and have found it gives a longer lasting hair removal option. The Philips Satinelle Prestige is RRP $299.95 which is a good investment. You will save on batteries (it’s rechargeable) and save on disposables, plus you have the added bonus of other beauty tools like the massager and exfoliator. Disclaimer: I received a Philips Satinelle Prestige to facilitate this review. I received no payment and this post is written by me and all opinions expressed are my own. Thanks to Philips I have one of these awesome Satinelle’s to giveaway. 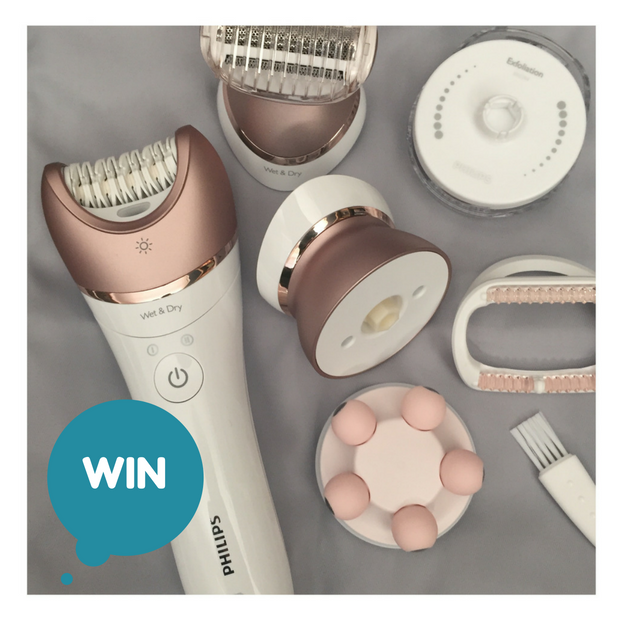 To enter: Tell me what your fave feature of the Philips Satinelle is and why? Competition ends 1 October 2016. Full T&C’s can be found here. The wider epilation head is the real winning feature for me – less time on hair removal means more time for the fun parts – makeup and hair. So instead of being a hair-free hot mess I could be smooth, sleek and looking good!!!! No more worries about batteries going flat, priceless. Choice, I love that I can choose a better me with each attachment! I love the prestigious look it gives the bathroom! With two boys all I normally see is stained clothes strewn over the floor and beheaded action figures in the bath tub. It would be a nice change! My favourite feature would HAVE to be the light! Means this mumma can have a nice relaxing candlelit bath with a glass of wine at the end of a busy day, and still be able to see those pesky run away hairs! Teamed up with the massage head for the ultimate hair removal experience! I love that you can use it in the shower, wet or dry and that its also a massager and exfoliator in one! Massage while Epilating!! Brilliant…low pain threshold here! I love the versatility of convenient and customisable beauty tools. We all love a jack of all trades! I love the idea I can use it in the shower!! Convenience for a busy Mum who needs to save time but look after herself too! I really love the cordless factor.. I could epilate while watching the kids outside, I could do it in the bath or on the train! LOL, not really but Sydney transport is such a pain, the literal ouchiness from epilation would be a welcome distraction! My adult son commented last week that my hairy legs needed ‘maintenance’.. lol The fact that this beauty works wet or dry is great for me. Sometimes I’m not in the mood to do a ‘wet shave’ so I would love the option of either wet or dry. The massager sounds awesome too! You had me at ‘easy to use’. I seriously can barely remember to buy milk at the grocery store when its the ONLY thing I needed, so easy is so good for me. I love that it doesn’t just shave, it exfoliates and massages too! This would be an amazing beauty tool to have! With the Philips Satinelle Epilator, I would be a master hair manipulator. Removing hair whilst in the shower, in my hand I will hold the power. Caring for a 1 year old is pretty tough, so my legs have gotten kinda rough. What is my favourite feature you may say, the body massager keeping knots at bay! Used wet or dry, cordless too. So easy to use, only the Satinelle will do! I love the Wet & Dry feature with The Philips Satinelle Prestige, no mess, just fuss free and hair free! 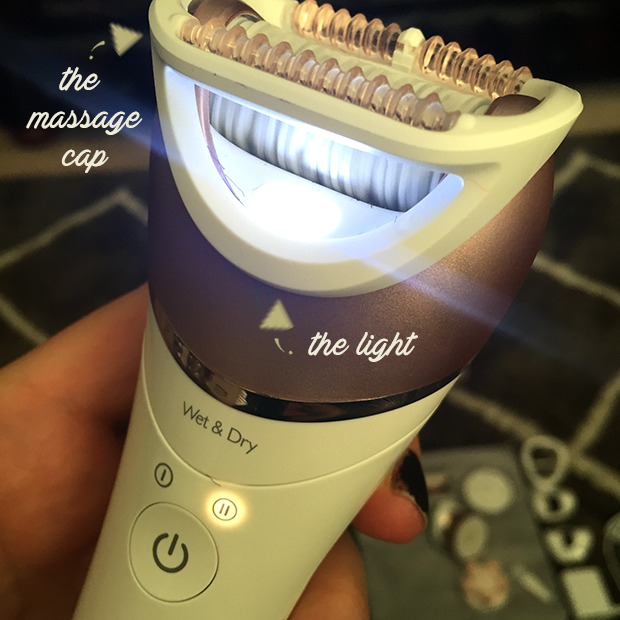 Well, apart from the fact that it could replace my old and dying epilator for that silky smooth finish, I love the fact there is a massage head. My partner said when I get a proper massager he will give me one…perfect! The wet and dry feature is the best; I think using in the shower would be less painful for me but I need the option of using dry because I just know I’ll forget to take in the shower with me! The rollers on the massage cap to reduce the pain. I’ve used epilators before that were so painful! Would love to give this one a try! I love the light feature. Our bathroom light switch is on the outside and the kids think it hilarious to plunge me into darkness when I’m in the shower. It could double as a torch. The massage cap. Us mummies have to multi task, and massaging while depilating is the ultimate of multi tasking. I love the fact that I’ll be able to use it in the shower on the go! usable in the shower because who has time for a bath! The exfoliation brush to keep my skin feeling fresh and vibrant! As old legs get hairier but the vision’s a fright, I love the Satinelle’s super-helpful LIGHT! I once owned an epilator years ago but it was too painful to use so I gave up on it. The Philips Satinelle has come a long way from the one I had! My favourite feature would have to be the massage head. Anything that can save me from pain is most welcomed! I would love to try this in the shower, so the Wet or Dry function is my favourite feature. The massage cap first of all. I’ve tried an epilator once before and it hurt!! Secondly, the wet and dry usage. Great time saver. Being able to use it wet or dry makes it so convenient! Using in the Shower – ‘Water’ way to ‘H2GO’! Wet or dry, options for Mums on the run, love it! I like that it will deliver what it claims to and really help my skin. I love that I can use it in the shower which is pretty much the only time I remember that I have hairy legs!! The rollers, which ease the pain, have to be number one as I am a total wimp. This is a magic Philips product. Love the use of ceramic material for better friction. My wife would love this because she has a bad back & this would make it quicker & easier for her and love that it is rechargeable and can be used wet or dry. Every feature makes this a brilliant new product. Thanks. Massage cap to reduce any discomfort from the epilator – hairy and crying is not a pretty sight! The light is my favourite, regardless of what hair removal method I use I always miss a patch because my bathroom is so dark! Now that Spring is here, I’d be super keen to try the body exfoliation attachments so I can achieve smooth skin before summer arrives! I would have to say the light would be my favourite feature; I’ve never used one before so being able to see what was going on would lessen the nerves! That is cordless and rechargeable. The wet or dry option! I love the massage cup. The less pain the better! Fabulous idea! I love that I can use it both in the bathtub and in the lounge room infront of the tv! Epilating has never been more fun! I like that the Satinelle has the widest epilation head (30mm) which gets more hair in each stroke, saving so much precious time! Trimming comb (for the shaving head). Can take it everywhere with me! I love that I can use it in the shower and that it comes with a delicate area cap, hello bikini bottoms! I really like that it has a built in light feature! I don’t think I’ve ever seen that before, so it’s certainly innovative and a great feature to have. I also like that it has the massage attachment!! This sounds like a fantastic epilator. I’d really love to win so thank you for the opportunity! I love all the features, they are totally gold and treasure my hair with care! Everything about the Philips Satinelle looks classy! I am loving the light! My eyes are bad at the best of times and I find going out in the sunlight I see all the hairs I have missed. With this they will all be gone!! wet and dry, shower or bath, perfect! Hi Amanda, Im not entering lol, just annoying my sister 🙂 she driving me nuts!! I love that the Philips Satinelle can be used in the shower for those last minute social invites it would provide convenience for when I’m in a rush and need to multi task! Love the light feature make it so much easier to see. It sounds like the massaging head will reduce the pain which is the reason I’ve never used one all these years. So that would be AMAZING! The fact I can use it in the shower will definitely help with the clean up, nothing is worse than having to clean up stray hairs that fly everywhere! To save that from ever happening again i would have to say the light would be my favorite feature, to illuminate any overlooked stubborn heinie hairs and epilate them accordingly! I love that it can be used in the shower! I’ve had my arm in a cast for a few weeks I could really put this to work!!! My favourite feature is the body exfoliation attachments….wow a shaver and exfoliator!!! Saves more money !! There are so many great features but the two that I love is the massage attachment and it can be used in the shower. Now I can ease the knots in my shoulders while enjoying a hot shower. i love that it can be used in the shower, hopefully making the hair come out easier!!! I love that three are eight attachments for the Phillips Satinelle making it the ideal product that is perfect for all my grooming uses. I would love this as I would no longer have to use multiple tools for each job! 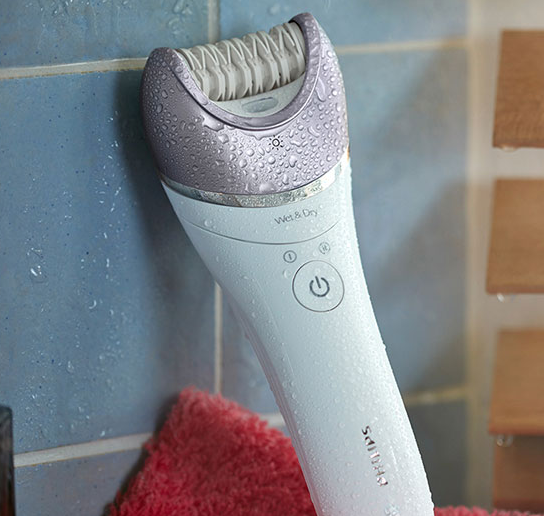 I love that it is rechargeable and I can use it in the shower with no cords – versatile! Love, love, love the light. Very inventive. I’m as blind as a bat so this feature will most certainly come in handy. The light is my fave!! There’s certainly a lot to love! Plus a good price when push comes to shove! Would have to be the light! !